Office workers spend a substantial portion of their time in an office environment. This environment should be designed to be safe, efficient and comfortable. According to the World Health Organization (WHO), the workplace is “a priority setting for health promotion”. Recently, this definition has broadened its scope by including aspects of subjective well-being in organizations, which represents a mayor opportunity for positive design in the context of office environments. Findings of positive psychology indicate that one way of increasing our levels of happiness lies in our daily intentional activities. Accordingly, activities and experiences were put to the fore as a means to design for happiness. 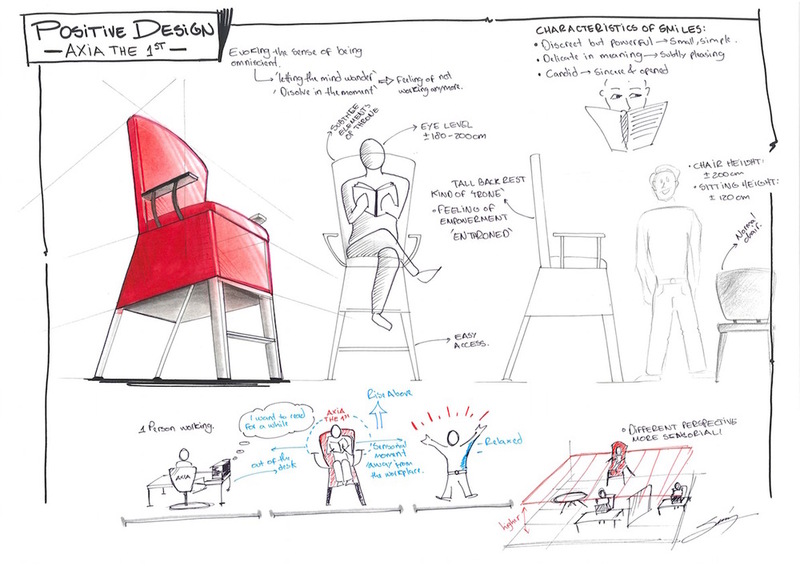 The final concept “Gibbous Chair” was inspired by a personal anecdote taken from the initial user study of this project. 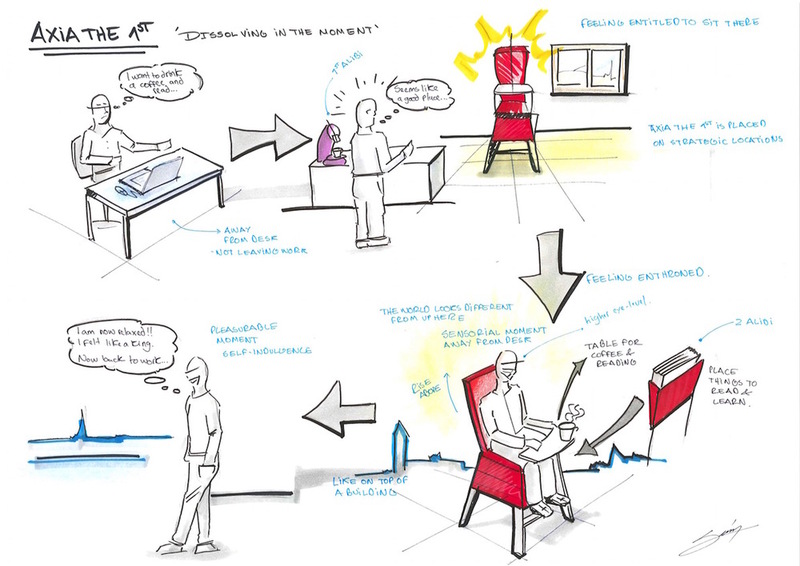 The narrative was translated into a general experience pattern and used as inspiration for design, considering the important elements that made it meaningful. "It's not so much the chair, but how it changes your perspective at work"
The gibbous chair is an elegant piece of furniture especially designed for the office environment as a resting chair. 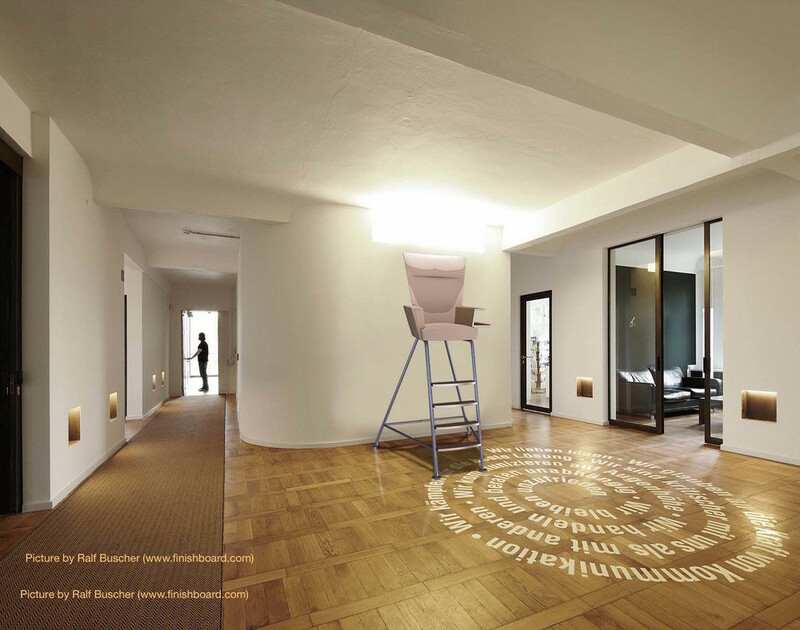 The chair provides the context to ‘let one’s mind wander’ and ‘dissolve in the moment’. This experiential intention is defined and mediated by a number of elements, e.g., a pronounced height of the chair, a coffee table that is too small to be used for work purposes, and a context location that allows privacy as well as a good overview of the surroundings. 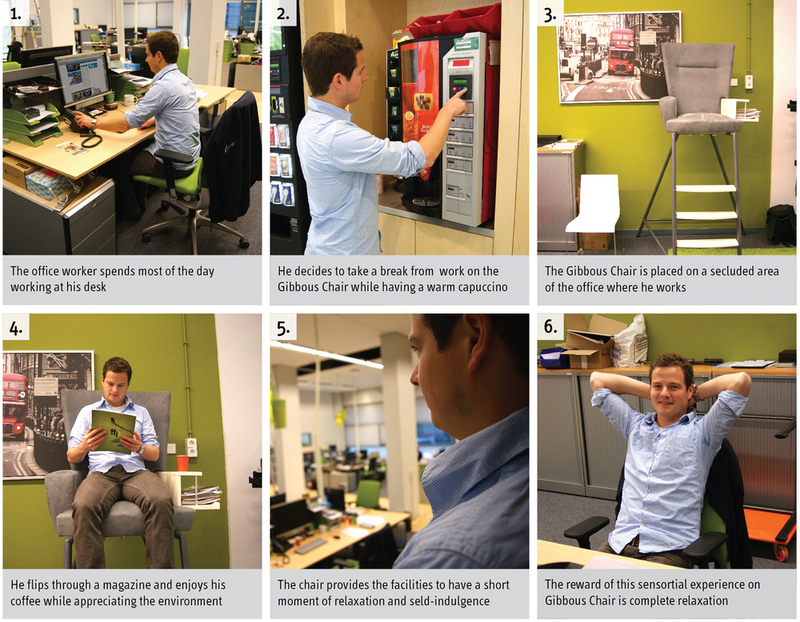 In Gibbous chair, office workers find the facilities to enjoy a short moment of relaxation and self-indulgence. A 1:1 prototype was built and tested in an office setting. Important findings include the positive perception of the design by most participants, and the rich and varied descriptions of their experiences while using the chair. Some described it as being on a different layer, as a new and fresh perspective, and even as a ski lift bringing you through the clouds. Gibbous chair is a novel type of office furniture. It promotes happiness by enabling office workers to have a pleasurable experience that permits a brief moment of physical and mental distance from the workplace while still being at the office. On the left some images of the design process can be appreciated. e.g. 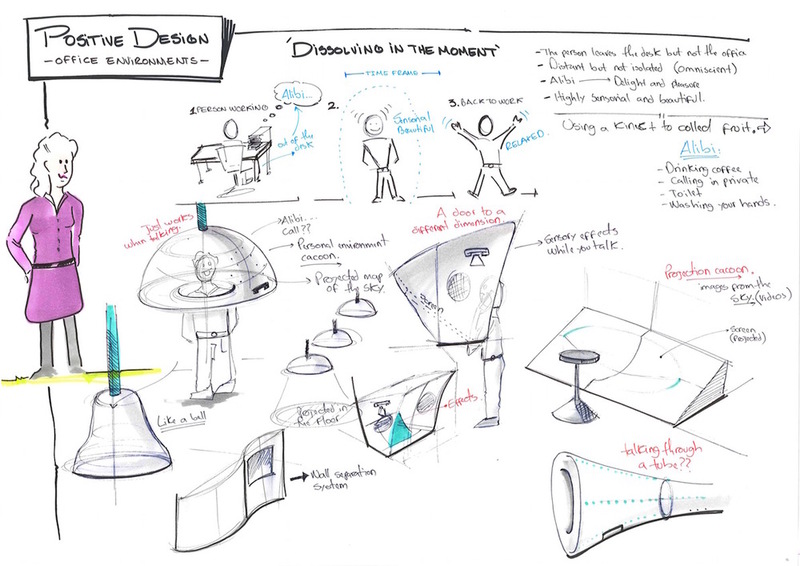 The booklet-diary that served to collect anecdotes, the ideation sheets, and the prototype. In the page 'Possibility-driven Design' you can see a follow up of this project.